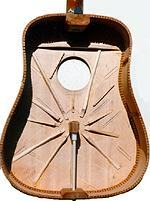 This Guitar used to be a Taylor 410. The guitar was damaged in a flood and I got it with all of the braces loose and knocking around inside, so I steamed off the back and rebuilt the guitar. The theory was that the JLD Bridge System could handle the structural responsibilities so the bracing could be redesigned entirely for tone. With that in mind, I eliminated the bridge plate completely and allowed the JLD System to serve as the new bridge plate. I also routed the bridge down to almost nothing and took the wings off. Theoretically, the guitar top will now function like a speaker cone which has a voice coil in the center (the bridge) where sound enters, and then a speaker cone (in this case; the top itself) which gets progressively more flexible towards the edges. Notice that the braces stop just shy of the bridge. This allows the bridge to move as much as possible and transmit more sound to the top and to the tailblock via the soundpost. The braces then taper towards the edges and fade to nothing. I left the bass side just a bit more flexible by using shorter braces. I also removed one of the tongue braces under the fingerboard extension (the original design had two), and then scalloped the other one on the underside before gluing it back under the top. You can see where one of the radial braces passes through the scalloped area on the tongue brace. Here, I'm trying to use the brace to "pipe" sound up into the shoulders of the guitar. On the back, I assumed that the tailblock was going to be a "hot spot" because of the JLD Bridge System soundpost. (You can see the JLD System installed in the above photo.) The fan braces are designed to conduct sound from the tailblock through the back. The transverse braces are designed to keep the longitudinal grain from splitting. 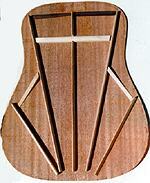 They're all of sitka spruce which is cut thin, but high for maximum stiffness to weight ratio. The results? Well, I was really disappointed at first. I'm used to the JLD System taking a little time to break in, but this sounded unusually nasal for the first few hours or so while the guitar settled. Ultimately (to my great relief), the guitar warmed up quite nicely. Several months after completing the project, I found the joint between the tailblock and the top had also suffered some water damage. I reglued this and immediately found the sound improved even more. The guitar has an unusual clarity and volume. There's an unusual natural reverb quality to the sound and the instrument really cuts through at a jam session where its bright treble rises over the midrange mud. I've been playing this guitar for over six months now and find that the top is still flat and the sound continues to open up. The instrument has great projection and unlike most guitars which seem to max out dynamically, if you hit a hard accent stroke while playing rhythm, there is no practical maximum volume. It's a cannon! There's a certain almost-but-not-quite electric quality to the sound but I'm not sure that's such a bad thing. The guitar's brightness and incredibly even response make it great for certain kinds of music and for jam situations. I'm pleased with it and play it as much as my Lowden D-10C. Most importantly, this guitar proves a few points and I hope that some luthiers with more skill and experience than I have will see the value of the JLD System and refine these concepts. Someone with a better feel for voicing tops could probably improve dramatically on this bracing system. First, this design effectively proves the JLD Bridge System can handle ALL of the structural responsibilities of keeping the top flat. Once we can brace strictly for tone, we can eliminate or modify the bridge plate, change the design of the bridge and change the design of the top and back braces in the guitar. More importantly, we can experiment with a number of different possible models of how a guitar produces sound and build instruments that reflect these theories. Given these possible variables, there is another whole universe of exploration available and numerous opportunities to evolve the instrument.